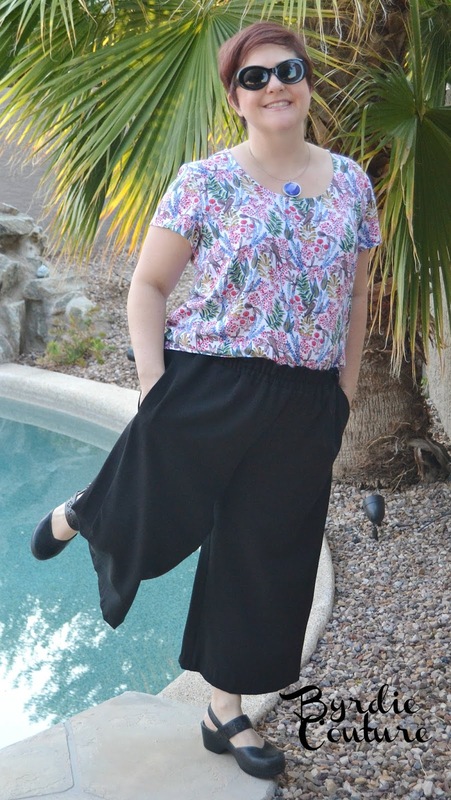 I've been loving the wide leg pant look that has been all over Instagram lately. My wardrobe has been in need of new slacks for work and I knew I wanted to add some wide legs to my repertoire. There are many patterns out there. I went with Simplicity 8605. 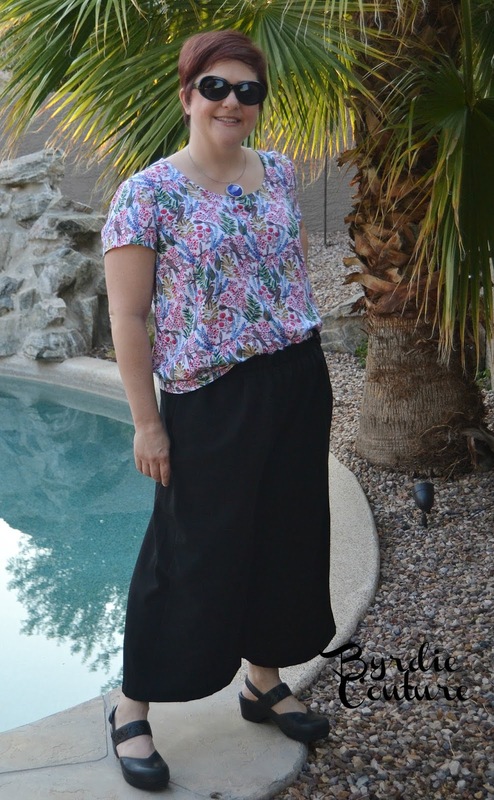 The pattern features the wide leg pants or capris with an optional tie belt. I used a rayon/poly/lycra fabric from Joann's. I spent about $15 on fabric. These were extremely easy to make. My favorite pant length is ankle. Because I am petite, I went with the cropped length, knowing that they would end up at the right spot. Other than that, I made no changes. I wore them for the first time today as pictured to work. I felt a little out of my element because they are so wide but they were well received and I had several compliments. And they are hella comfortable! Seriously, I never want to take them off! I've got another version planned in a tropical linen print, and am considering a pair made out of gray suiting. Next up is the Grainline Studios Scout Tee pattern. OMG peeps, why have I waited so long? I think this was their first pattern out, what, like 6 years ago?!?! What can I say? I was waiting for the 90th review on PR to come out to convince me to make it already. I won't bore you with all the nitty gritty as you can go read for yourself. All I will say is that I made the size according to the pattern recommendations. I did make a slight large bicep adjustment. Apparently that's the PC way to say fat upper arms. It sewed up quickly. I've made 2 so far. 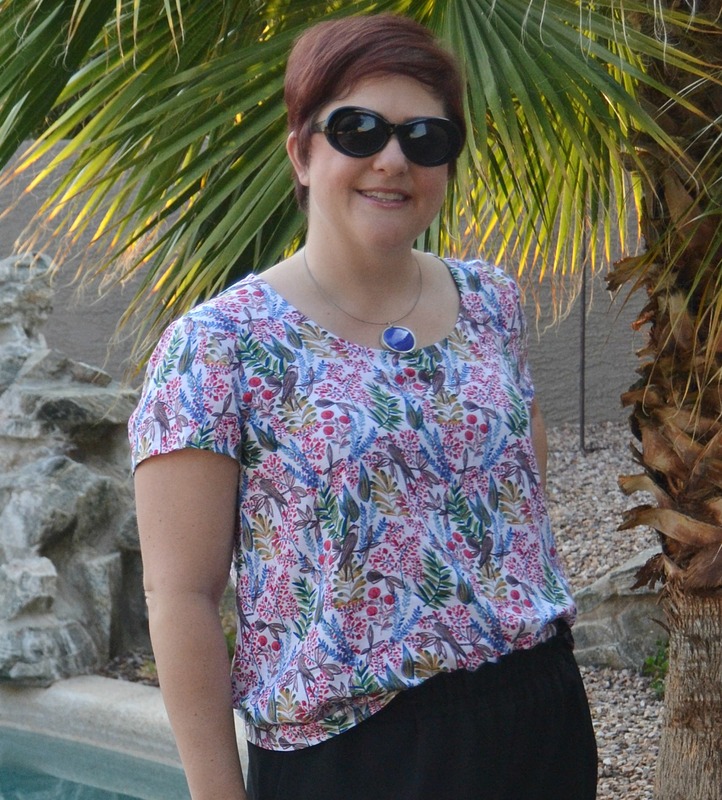 This one is pictured in a rayon print from Joann's. Spent about $10-15 on this one. The heat in Phoenix right now is brutal. It is nice to have a breathable, breezy top that floats away from the body. Will definitely be making more. Both look cool and comfortable! I especially love that floral print. Yes, they are so comfortable! I almost feel like I'm cheating by wearing the pants to work! Super cute outfit. I am totally digging wide legged pants still too. Thank you! My husband isn't sold on the look but I still love them! Beautiful patterns of fabric colors. Thanks for sharing your projects with us. I am waiting for more of your work! I love to discover such blogs on the Internet.